Whether your want to do-it-yourself or have a lab do it for you, testing your water is one of the most important steps you can take to help ensure the health of your loved ones. The Water Key recommends the following test kits; one that gets sent to a lab and one that you can do at home. H2O Health Solutions has a professional, full spectrum water test kit covers dozens of contaminants, including heavy metals, Chlorination byproducts, pesticides, and Coliform bacteria. The water is analyzed by one of the most respected labs in the country. All you need to do is fill the sample bottles in the manner prescribed, and send your kit back to the lab (overnight shipping service is required for accurate bacteria results). Your test results will arrive in approximately two weeks. 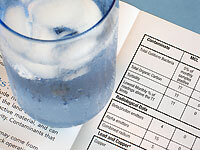 If you have any questions about your test results, you can call H2O Health Solutions any time to help you interpret the results and to recommend appropriate water systems. 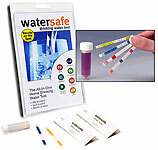 The Watersafe® All-In-One Test Kit is a convenient and affordable way to find out how safe your drinking water is. This simple, do-it-yourself test kit gives professional lab-quality results for (Bacteria, Lead, Pesticides, Nitrates, Nitrites, Chlorine, pH and Hardness) 8 of the most common and potentially hazardous contaminants found in drinking water. Sample your water today and watch results appear right before your eyes! For your family’s health, you'll be glad you did. • Covers dozens of contaminants, including heavy metals, Chlorination byproducts, pesticides, and Coliform bacteria. • Water is analyzed by one of the most respected labs in the country. • Fill the sample bottles in the manner prescribed, and send your kit back to the lab. • Your test results will arrive in approximately two weeks. This do-it-yourself water testing kit allows you to get professional lab results in your own home, find out if you have "hard water", detect dangerous amounts of chlorine, test for presence of bacteria, reveal the presence of deadly toxins (from pesticides or fertilizers), learn your water's pH balance, compare your results with EPA-recommended levels and most of all…feel confident in the water you drink! The information on this website is for educational purposes only and it has not been reviewed by the FDA. Products offered or recommended herein are not intended to treat, cure or prevent any disease or health condition. No medical claims are being made or implied. The information on this website is not intended to be a substitute for medical advice, nor is it intended to replace the counsel of a health care professional. No one at The Water Key, including the owner or staff, directly or indirectly dispenses medical advice. If you have a health concern, contact a qualified health care professional. Copyright © 2008 The Water Key. All rights reserved.